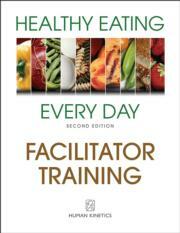 The self-directed Healthy Eating Every Day Facilitator Training Course introduces the concepts needed to facilitate behavior change in groups of adults who want to improve their eating habits as a regular part of their lifestyle. Introduces you to the mission and principles of the HEED program and how applying these concepts can help your participants improve their health and quality of life. Explains the ways certain behaviors are connected to good health. Discusses the public health guidelines and the research that has proved the benefits of improving health through healthy eating. Explains why theories such as social cognitive theory are important to helping people change their eating habits. Describes the primary theory used in HEED: the transtheoretical model, often called the stages of change model. Explains the solid scientific foundation on which your HEED program is based. Explores how adults learn best and what that means for you as a facilitator, including how you can improve learning and keep participants’ attention in class. Describes general counseling principles that will improve your effectiveness as a facilitator and explains the importance of the areas of ethics and confidentiality. Describes how to prepare for each class session and how to maximize participation in your program. Reviews how to analyze participants’ HEED assessments and food-tracking logs. Explains how to evaluate the processes and outcomes of your HEED course. Describes what you can and cannot change along with adaptations you might make for special populations or different settings. Explains how to identify budget items, how to complete a budget worksheet, and how to market and promote HEED to your target audience—everything you need to build a cost-effective, high-caliber program.